This training was presented through the UNDP-FAO Integrating Agriculture in National Adaptation Plans (NAP-Ag) Programme. The programme is funded by the German Federal Ministry for the Environment, Nature Conservation, Building and Nuclear Safety. Photo courtesy UNDP Zambia. Don't miss the upcoming free MOOC on Building Climate Resilience in Agriculture. napmooc.uncclearn.org. 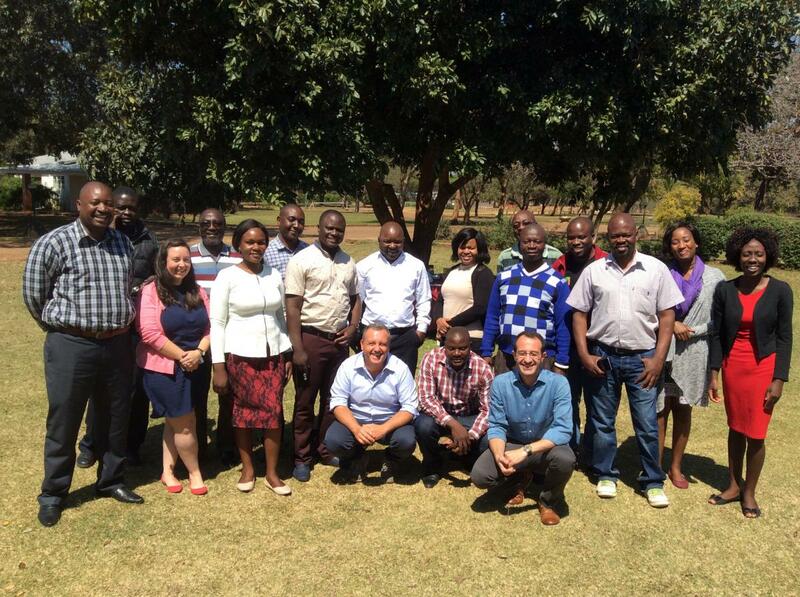 November 2017, Chisamba, Zambia - Seventy-eight kilometres north of Lusaka, in the peaceful countryside of Chisamba, 20 officers and field technical staff from several Ministries (Agriculture, Forestry, Environment and Resources, Planning, Development, Finance) and national research institutes gathered together in a five-day training workshop on Cost-Benefit Analysis (CBA) for Climate Change Adaptation in Agriculture from the 14 to 18 August 2017. The workshop - jointly organized by FAO and UNDP Zambia Country Offices and hosted by the Ministry of Agriculture (MoA) - is one of the key activities aimed at supporting developing countries through the Integrating Agriculture in National Adaptation Plan Programme (NAP-Ag), an initiative funded by Germany's Federal Ministry for the Environment, Nature Conservation and Nuclear Safety (BMU) through its International Climate Initiative (IKI). The main purpose of the training workshop was to strengthen capacity of technical staff and decision makers on the practical use of CBA as applied to adaptation options in agriculture. In particular, participants were guided on how CBA can be used to broaden and improve the decision making process while dealing with climate change variability and uncertainty. Throughout the workshop, theoretical foundations of CBA applied to climate change were constantly intertwined to hands-on sessions, group works and real data exercises on Excel. The learning-by-doing approach was considered a key driver for increasing awareness on practical challenges related to well-grounded quantitative analysis as well as the challenges and opportunities climate change poses to rural farming in Zambia. Following the course overview, the first training session focused on definitions and relevance of key concepts in the economics of adaptation. Highlights of the presentation included definitions of adaptation, resilience, a framework about costs and benefits of adaptation, and an overview of financing funds for adaptation to climate available at global level. During the afternoon session a review of project cycle and theory of change was provided, outlining the importance of project planning to ensure successful implementation. The trainers then introduced the role and importance of CBA as a decision making tool, detailing the steps of financial analysis. The first day ended with a practical exercise session on financial budgeting where participants were required to apply concepts learned during the course using a preformatted Excel file. Consequently, results were discussed in a plenary session before the end of the day. The nature, scope, drawbacks and calculation methods of key profitability indicators used in CBA were discussed during the second day. Concepts around time-value of money and discounted cash-flow analysis were also extensively presented. Another practical session followed and participants were required to calculate NPVs and IRRs using farm models. Results were discussed and interpreted during a plenary session. After the exercise, the discussion shifted towards concepts of economic analysis, shadow pricing and externalities. Practical examples were provided and another hands-on session and discussion of results closed the day. After reviewing key concepts from previous sessions, the stage for day three was set to explore how to deal with uncertainty, risks and sensitivity analysis in CBA applied to climate change. More advanced techniques, such as the Monte Carlo simulation, were also introduced to the participants. Practical examples and two project case studies on CBA for climate change adaptation were presented. A Q&A session followed prior the end of the training day. The session on day four was devoted to preparing a work plan for the case studies to be carried out by the participants. These case studies will be used as pilot cases to apply the CBA method in the context of on-going agriculture adaptation projects in Zambia. Individual presentations and group discussion helped to build consensus around which of the case studies should be considered for the work to be developed by participants after the training workshop ended. Afterwards, the trainers presented two more case studies on the practical application of CBA for climate change adaptation. Examples from these real life and practical applications were meant to inspire and reinforce the learning among the trainees. With this exposure, it is hoped that the participants can apply the CBA and other analysis in the case study work that they will undertake after the training. This is seen as means for continuous learning so that they do not lose the skills acquired from the training. "The course has opened up my mind to the interesting concept of cost benefit analysis. CBA is an important analysis to know before understanding any project to reduce wastage of resources"
The NAP-Ag Programme believes that training workshops like this one are effective tools to increasing awareness and technical capacity of local institutions on integrating climate change concerns into relevant national and sectoral plans. As participants achieve a greater understanding of the relevance of evidence-based decision making process, the NAP-Ag Programme hopes they will contribute to nurturing a better-informed prioritization system and process for planning development interventions with adaptation benefits.